The Apple iPad’s initial buzz has come and gone, and with the dust settling, it seems that many parties are not looking at it with nods of approval. After all, there are many gripes and issues that potential users would run into, and the fact that Apple seems to be trying to create a new niche market with it could prove to be a much more difficult sell compared to the iPhone when it first hit the scene in June 2007. Well, killer apps are what devices are all about these days, as having fantastic hardware alone is not good enough anymore. What are some of the more practical uses that you can think of with the iPad? 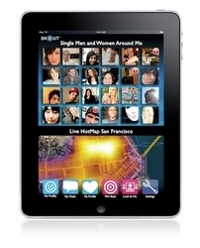 Some folks are already quick off the blocks, with Skout ready to hit the market the moment the iPad rolls out in 56 days’ time. The Skout, you ask? What’s that for? Well, proceed to the extended post for the answers, ladies and gentlemen. Many of us have a bathroom scale stashed away somewhere (which would normally be in the bathroom itself, hence its name), but how many of us step on it with trepidation? We are often afraid of the numbers that greet us, and is one of the few instances where more is not necessarily better (unless you’re trying to bulk up after drinking all those protein shakes and pressing iron for hours on end at the gym). Well, time has passed, and the ordinary bathroom scale received minor upgrades which includes a digital display over the last decade, culminating in the Withings Wi-Fi Body Scale. 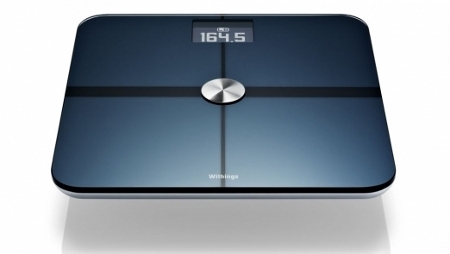 Well, it looks as though the Withings Wi-Fi Body Scale has received an update, making it the first Wi-Fi-connected personal scale in the world that boasts integration with the Google Health service. In a nutshell, the Withings WiFi Body Scale is capable of providing updates to a user’s Google Health profile in real-time thanks to its integrated Wi-Fi connection. Most of us have a few USB flash drive these days, considering the extremely low prices that flash memory has dropped to. However, many of us USB flash drive owners don’t really think about security in the event where our little peripherals go missing out of carelessness, forgetfulness or theft. Imagine the sleepless night that would ensue if you have mission critical and sensitive data on it – not a nice thought to have, that’s for sure. Kingston understands this, and have unveiled their latest DataTraveler 500 which is a FIPS 140-2 Level 2 certified with Level 3 pending device, boasting 256-bit AES hardware-based encryption. Apart from that, the DataTraveler 5000 will utilize XTS cipher mode as well as elliptic curve cryptography (ECC) algorithms in order to meet Suite B standards approved by the U.S. government. The last time we reported on the Pogoplug, it was when it made its initial first appearance at CES 2009. I’m guessing that it probably had some appearance at CES 2010, and if you compare the pictures from our previous posting, you can see that the Pogoplog has evolved, appearance-wise. In case you don’t know, the Pogoplug is a device that allows its users to share content from a hard drive all across the Internet. Like the slogan says, it is “your personal cloud”. The company was generous enough to supply me one to review. When I opened the box, I could not find any written instructions that tell me what to plug into what. There was a little paper that told me what site to go to, and this is where I learned to set up the hardware. Classic games just aren’t the same if you play them using a keyboard. You just can’t get the same feel. 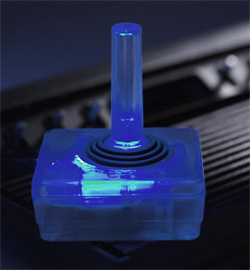 Well with this controller you could get more of that retro feel while still using your updated technology. I’ve also heard that the retro games don’t look as good on our pretty flat screen monitors, but I’m afraid this controller won’t help with that part. Bottom line is, you’ll have to make a small compromise. Now this is a machine that I just had to report about. 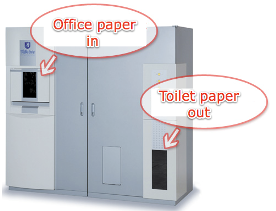 A company known as Oriental (yes, it is an Asian company) has created a machine that is very appropriate for offices called the White Goat. Yes, I would have gave it a nicer name, but honestly, White Goat is probably the most descriptive name for a machine that can turn shredded paper into toilet paper. I am being completely serious here. All you need to do is feed the machine 40 sheets of AR office paper, and let the machine do its work of shredding, dissolving the strips in water, thinning it out, and then drying it out and winding it into the rolls. In just thirty minutes, your office TPS reports are a roll of TP, without the tube in the middle. There is a video after the jump if you would like to see it for yourself, and I highly recommend that you do.